I love cookies. There is nothing so good as a portable bite of sugar and yumminess. You can munch them, freeze them, share them, or horde them. They really are great. I thought I’d try to make peanut butter cookies today. They take only a few ingredients and cook fast. Plus I have lots of peanut butter in the house. Of course, I tried to make them healthy, so I lessened the sugar content substantially. Then I baked them in the preheated solar oven for about 20 minutes per tray. They baked up fine, though a bit crumbly, and I was excited to taste one! The batter tasted great! However, as is often the case at my house, the cookies were not so great. As it turns out, without adequate sweetener, peanut butter cookies are very bland. And I did not adequately clean the cooker after my husband cooked his chicken in it yesterday. 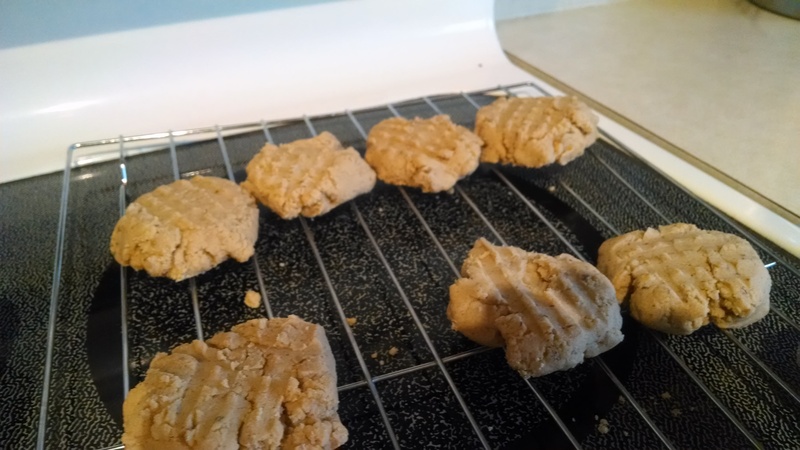 The result: bland peanut butter and chicken cookies. Yuck! I was sad about losing out on the cookies until another friend suggested that I rename them and call them gourmet dog biscuits! So smart! My dog loves them! Cream all ingredients. Drop onto cookie sheet and press lightly with a fork. Bake in chicken- smelling solar oven for about 20 minutes. Rating: terrible for people, but my doggie loved them!